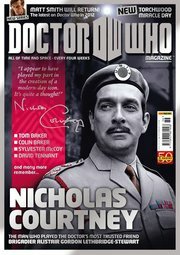 Nicholas Courtney died in February, and a special edition of Doctor Who Magazine (edited by Tom Spilsbury) will shortly be published as a celebration of his life and work, especially in Doctor Who. This reminded me that there is an interview with Nick in issue 11 of In-Vision, a monthly magazine that I edited with Justin Richards for Jeremy Bentham’s Cybermark Services. It was published in December 1988. 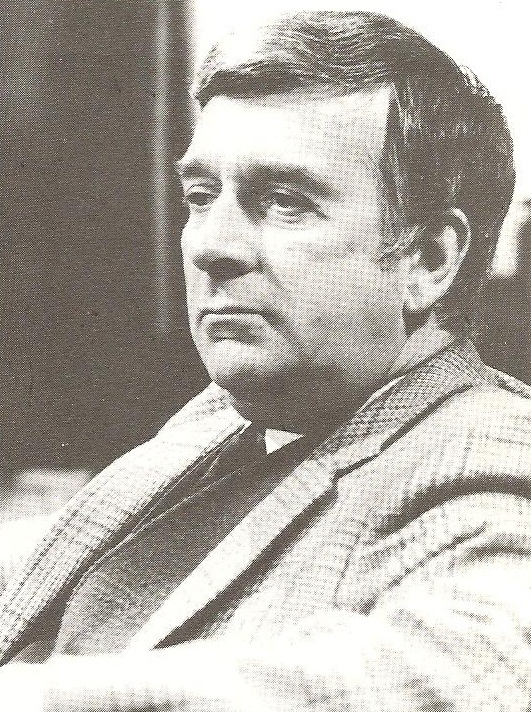 “Playing the Brigadier came easily to me,” says NICHOLAS COURTNEY, who reveals his thoughts to IN-VISION about the man from UNIT. The first I knew that my role as the Brigadier was going to be more than a one-off was when I got a call from Doctor Who producer Peter Bryant. It was around the time that Pat Troughton was leaving the show and Jon Pertwee was about to take over. Peter has wondered if the idea of UNIT would work as a permanent feature of the programme. They had decided to base the Doctor on Earth, but he and script editor Derrick Sherwin were still working on how it should be done. They asked me if I would be interested in a one year contract, and I said yes. At the time, my daughter was about to be born, so it was nice to be offered a degree of security. This was shortly after “The Web of Fear”. Then they did “The Invasion” as a sort of dummy run to see how it would all work before finally committing themselves to the idea for Jon Pertwee’s start, by which time it had been confirmed that I would be a regular cast member for two years at least. What had attracted Peter and Derrick to Lethbridge Stewart so much, I have no real idea. Originally, of course, he was only a colonel in “The Web of Fear”. Although that in itself was a step up from the rank of captain Knight, which was the character I had initially been offered by director Douglas Camfield. Knight gets killed half way through “The Web of Fear”, so when Douglas called me to tell me David Langdon has dropped out from playing the colonel, I was quite happy to accept both his role and the promotion, even though it was the same rate of pay. For “The Invasion”, less than a year later, I was promoted again — to brigadier. So you can imagine if this had been the real army it would have been the most spectacular promotion history on record. As to what made me so apparently ideal for the part of the Brig, again I have no real idea. Except that I had played army officers before, for example Captain Freemantle in Evelyn Waugh’s trilogy “Sword of Honour”. It may have had something to do with the fact that my father was an army man professionally. He had fought in the First World War in the trenches, and he retained his uniform even when he went into the diplomatic service in Kenya and in Egypt during the second war. Certainly, coming from that background, I never found any problems later playing authoritative figures even though it isn’t in my nature, I don’t think, to lead anyone. Except maybe perhaps astray. So being the Brigadier did come easily. But as time wore on I found I wanted to invest the character with more than just a capacity for barking orders, something which tended to be boring to do. Eventually, much later on, I was allowed by Terrance Dicks to write some of my own lines to flesh Lethbridge Stewart out and make him more of a human being. Like blowing up the Silurians – but what else can he do, bearing in mind he always plays it by the book? Talking over the Brig with Douglas Camfield at the time, I remember we decided to base him on “Mad Mitch”, the hero of Aden; the sort of officer who would always lead his men from the front. The Brigadier, therefore. Would never ask his men to do anything he wouldn’t do himself – that’s what I believe makes good officers. I’d had a good opportunity to observe officers while I was in the army, doing my National Service in the 3rd King’s Own Hussars. There the good officers were the majors upwards. Some of the second lieutenants were what I’d call “chinless wonders” whom, I would have been very frightened to follow into the jungle. They were generally rather rich with private incomes, and therefore unprepared for dealing with the tougher realities of army life. The more senior officers, I think, inspired greater trust and confidence – aspects I tried to build into the Brigadier. The end result, I hope, was a character who would not suffer fools gladly, who was always visibly in charge and not afraid to rap it out if he saw Benton, or even his captain, doing something he considered stupid. It was important that he was seen as intelligent, otherwise I felt he would not have been in the positions he was; answerable to Geneva rather than London. That way he could get away with being cheeky to generals, as he did in “Invasion of the Dinosaurs” to General Finch (played by John Bennett). He could certainly laugh at his own expense. That’s one of the things that distinguishes British people, that they can laugh at themselves without any feeling of guilt or failure. Obviously the Brig would not do it in front of his subordinates, but with scientists, civilians, and especially with the Doctor I felt he could be less reserved. His line in “The Three Doctors” after they have all travelled in the TARDIS to this unknown wasteland, which I wrote myself, “Don’t worry, I’ve had a recce, and I’m fairly sure that’s Cromer out there” is typical Brigadier. The cameraman afterwards said to me, “I wish I could have put a close-up on you at that point” because he thought it was a very funny line. It had to be played straight though. Comedy is best when it’s unconscious. Another line I was allowed to write for myself was “Here we go again” during the Doctor’s regeneration into Tom Baker. After all, the Brig had been with Pat’s Doctor, had come to terms with the same person looking like – and behaving like – Jon Pertwee, and then been utterly appalled when Pat came back in “the here Doctors”, looking from one to the other as they argued and frankly not understanding a word of what was going on. But he did know that the Doctor was on the side of the angels – a hero that fought evil. And that made him a good man in the Brig’s eyes. In “Planet of the Spiders” there was some talk of this lady in Brighton, Doris. So maybe the Brigadier was married to Doris. Or maybe he was married to Fiona, and Doris was some past peccadillo. 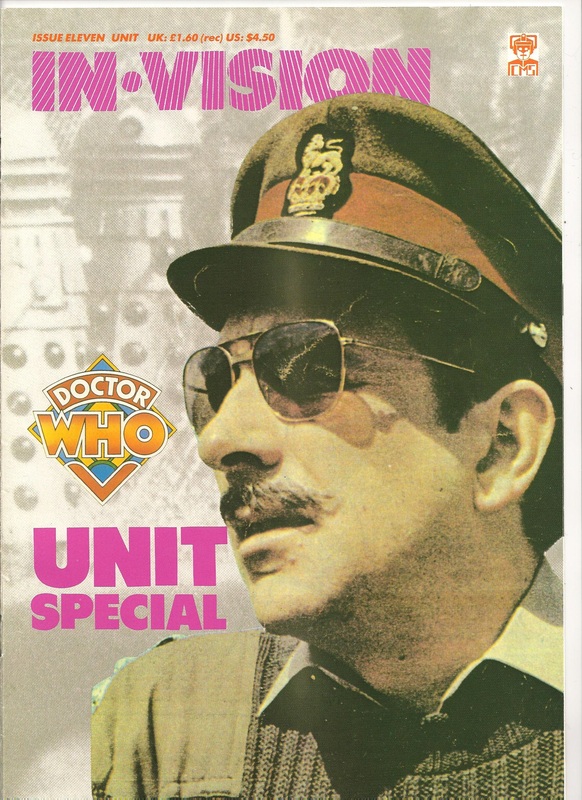 There is still, I feel, a lot that has not been explored about the Brigadier. I have written the plot for a book called “Whatever Happened to the Brigadier?”, which sees him recalled from retirement to Geneva to deal with a Middle Eastern conference. The idea, at present, is that he gets put in charge of security over the delegates. And there is an attempt on his life, which fails, and instead one of the Middle Eastern potentates is killed. It is a story grown out of my own family background, but I think that is often the best place from which to start as a writer. History and current affairs are my specialist subjects, which makes “Mawdryn Undead” interesting because there the Brig is teaching A-level Mathematics, a subject about which, at school in Egypt, my headmaster once wrote in my report: “I would defy anyone to drive mathematics into Nicholas’ head…” I followed my father in adopting history and current affairs, although neither of us I think could have been politicians because we never learned to be good liars. That too is a facet of the Brigadier; he distrusts politicians intensely and loathes having to deal with them. You might remember in “Terror of the Zygons” there is a scene where the Brigadier has to talk to the prime minister, and a woman prime minister at that because Douglas Camfield rewrote the line imagining the PM in 1980m possibly being Shirley Williams. Now it would have been irritating enough for the Brigadier to take instructions from a male prime minister, but a female one would have driven him mad because I always felt he was, secretly, a little nervous of women. That was the reason he always called the female companions “Miss Shaw”, “Miss Grant”, or “Miss Smith”. He was always courteous, always considerate, but at the same time he was the sort of chap whose true home was among the camaraderie of the Officers’ Mess. It was that sort of camaraderie which made those UNIT stories such a joy and a pleasure to work off-stage as well. 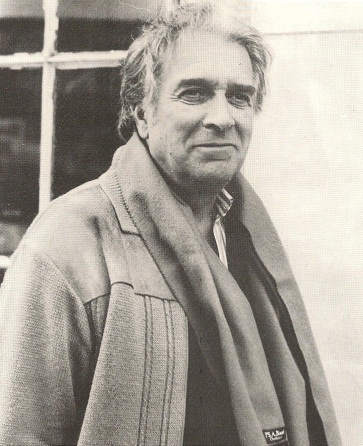 Jon was a marvellous leading man to work with; he always encouraged any cast to join in with the family feeling that genuinely existed between him, myself, Katy, Richard, John and, later, Lis and Ian. Strangely with Ian Marter, despite our immense friendship in later years, I never got to know him on the set of “Terror of the Zygons”. Then on a plane over to a convention in Chicago in 1983, we met again. And from then on till his death in 1986 we formed a bond that was quite unique. He encouraged me to write, we thought along the same wavelengths, we could do the most marvellous skits together at conventions where we would constantly take the mickey out of each other. And for those few precious years we were virtually inseparable. He was a smashing guy, and I miss him dreadfully still. Pat I immediately got on with, right from our first meeting on “The Web of Fear”. With Jon it took a little longer, about six weeks. When we first met, I had my part, but he was still finding himself as the Doctor – which is very difficult to do when you’re just taking over such a role. My problem was therefore to get Jon to trust me, and although it took six weeks, eventually he did and we’ve never looked back since. I remember on the set of “Inferno” Jon saying to me something that I thought was really smashing. We were rehearsing some lines early one morning when, without warning, he turned round to me and suddenly said, “You’re the nicest man I’ve ever worked with.” But that is typical of Jon’s manner. He taught me a lot about coming out of myself, because I used to be a very private person. He encouraged me to go out and open fetes, don charity events and, later, do conventions as well. So I owe him a lot for all that. Tom Baker I met during “Robot”, when he was just taking over. And for a while he and I used to go out a lot on the town together. He was very much foot-loose and fancy-free, although at the time I was still married. One night he and I had been out after work and Tom was looking for somewhere to stay. It was typical of Tom that he never knew where he was going to find a bed for the night, which is why he always carried a toothbrush in his top pocket. Anyway, I invited him to stay at my house which was fine, until, next morning, there was uproar when my young children charged into the bathroom and found Tom in the bath – stark naked. I don’t know if my children were impressed, but I don’t think Tom was. We used to go out a lot at the beginning, but sadly, a year later, on “Terror of the Zygons”, it just seemed to fall apart. There was a terrible atmosphere on that story. John Levene and I knew this was the end for our characters, and Douglas was upset because all the Skarasen model filming had gone wrong. So everyone was on edge, and I think it got to Tom as well. After a particularly difficult Producer’s Run where everyone was feeling nervous and irritable, he suddenly turned and barked at me: “You, Mister…” and started shouting at me because he thought I hadn’t followed the producer’s notes to the letter during rehearsal. It would have been better if Tom and I had done more shows together, but that all now depends on the future. For myself, as long as I am confident as to how I have come across as the Brigadier, then I think others are too. I’ve invested the role with much that is in me. To a large extent the Brigadier is me. But not all of me. I know my place. These are the top search results used by people coming to this blog. I’m not sure whether I should be so amused that more people come here looking for pixie-faced Russian minstrel Alexander Rybak than for, well, me. But I suppose I’ve never won the Eurovision Song Contest for Norway, so why am I grumbling? And at least I’m ahead of Richard Hurndall. Who, in turn, is ahead of all the other Doctors. Even the Morbius Doctors beat them. They’re really the Doctor, you know. Oh yes they are — go and read my post about it. PS: I realise that this post is not exactly going to improve my stats, is it? This is my favourite thing today. Look who was first to retweet.